Ira Nayman, What the Hell Were You Thinking? 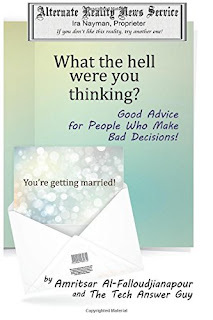 : Good Advice for People Who Make Bad Decisions: volume 6 (Alternate Reality News Service). Aardvarks Eyes Press, 2015. Pp 362. ISBN 978-1-9276-4506-2. $14.99. What the Hell Were You Thinking? Good Advice for People Who Make Bad Decisions! is a curious and fanciful good time. The book consists of a collection of advice columns in an alternate science fiction universe, where the greatest technological feats and most unusual discoveries have already taken place: virtual consciences, genetically modified beings, aliens, and more. The advice columns showcase a complex and rich world of scientific achievement and exploration, the stories in the letters range from bizarre to ludicrous, while always being fun or funny. As science races forward, and science fiction forges the way, satirist Nayman finds a clever way to remind audiences that even when we have computerized everything, we can augment reality, and we use science to fix every problem in the book, people are still people, who are going to get into ridiculous amounts of trouble. In Nayman’s alternate universe, people have such outlandish and silly problems they have no choice but to turn to the experts for answers to their woes. 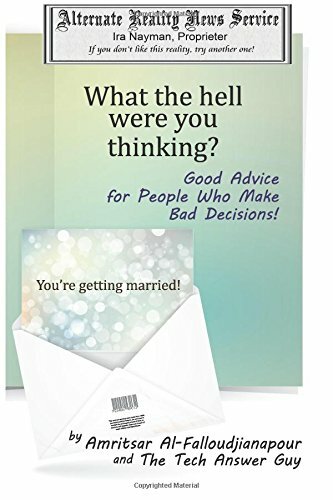 A main feature of the book is the relationship advice column with Amritsar Al-Falloudjianapour. “She’s not a trained therapist, but she does know a lot of stuff,” the columnist explains in her call for letters. And people write in. It may be telling that in this alternate science fiction universe, dating trouble is still the predominate concern. In fact, it turns out, Nayman illustrates, dating only gets more complicated when people can upload their consciousness onto servers, clone themselves, build robot partners, or download apps that finish arguments so couples don’t have to. Without the unique and intriguing backdrop of an advanced science fiction universe, the silliness that drives most letters might be too much to take. Much of the fun is in word play, puns and the ridiculous names and places these letters are coming from (Magder from Manchuria, Billy from Philly, or H0wdy in the D00dy). When talking tech, the characters don’t seem to have the same brand names that exist in our universe; instead they have products with some strange mutation of the original. Microsquish and Twitherd, for example. The constant punning and name switching is almost distracting. Even so, the author strikes a balance between silly and hard science that works quite well, bringing more the best of both. Furthermore, in the midst of some crazy, over the top, outright nonsensical story, the columnist manages to make observations, give advice, or otherwise comment on society and people in ways that are not only wickedly clever, but also utterly smart. Particularly impressive exchanges were when Jesus took to Twitherd and got a typical Twitherd response, or when a consumer accidently found the key to enlightenment through a computer glitch. The author doesn’t just parody tech companies. He mines the world of existing sci-fi/fantasy for material, which leads to answering some pretty important questions. What would happen if Frankenstein’s monster wrote in to an advice column? How often do Star Wars characters deal with computer glitches? When you upload your consciousness to the Net, is the virtual person online really you? It depends on what the definition of “is” is. The opening response is brilliant and hilarious to anyone in the know. Another delightful set of exchanges occurs when a lepidopterist, a person who studies butterflies, writes in to complain about a bully on a lepidopterist discussion board. Never has the topic of cyberbullying been more relevant. It turns out, however according to The Tech Guy “lepidopterist trolls are the worst” (168). Who knew? A lot could be said for the two main characters, Amritsar and The Tech Answer Guy. Their personalities come through distinctly in their columns. She’s a worldly confident woman, and he’s trying to avoid getting in trouble with his wife. There is something lacking in the letters coming in, however. One common thread throughout the writing is a near constant flood of parenthetical comments, in both the letters and responses. It’s done mainly for some punchline or witty retort, but again, it’s nearly distracting. It also contributes to the letter writers sounding the same, except in the most extreme of cases. And while the silly and preposterous keep the hard sciences at bay, Nayman occasionally broaches modern physics or quantum mechanics as warranted. The light touch he uses with such difficult concepts in a humorous story is impressive. Readers without the background won’t even notice, while readers with real passion for such subjects will appreciate the references for what they are… and how well they belong in the story. Lighthearted and fun, the book could be read quickly in a few days. And there would be some joy to that as a few letters are related to each other, creating some continuity. On the other hand, as most letters and responses are standalone stories complete with their own punchlines, the book may be designed to be enjoyed for only a few minutes at a time. This book would make an excellent addition to the coffee table, in case company had a few minutes alone and needed something to peek at. It would also work well, dare I say, in the bathroom.